BulbapediaHey everyone, JPN Gallade here! It looks like we have begun an all new year in the Pokémon TCG, and with that, the Autumn Battle Roads also begin. As the these days began to unfold, I managed to go to a few Battle Roads here in Illinois recently, and eventually, I managed to win two of them just last weekend in Oswego and Lockport, IL. Now it’s time to talk about my time at both of the Battle Roads. It all begins about a few months before Autumn Battle Roads started. After making Top 64 Cut at Nationals, I found that I couldn’t go to Worlds this year, so I decided to start practicing for the MD-on format. I decided to use Luxchomp, so I changed the deck around for a little bit for the coming MD-on format. I originally had a build similar to the one that that did the impressive job at Nationals, but then, as everyone knows, worlds eventually comes, and Yuta Komotsuda takes first place in worlds with a Luxchomp build with Dialga G as a tech. I found this rather interesting, so I decided to test this build. I took my Luxchomp/Dialga G build to the first Battle Road, and I really wasn’t that impressed with it. It just didn’t really fit my style. Sure it does well with Vileplume, but I thought back about my original build. For the following Battle Road, I decided to test it out, and I ended up taking 2nd place. 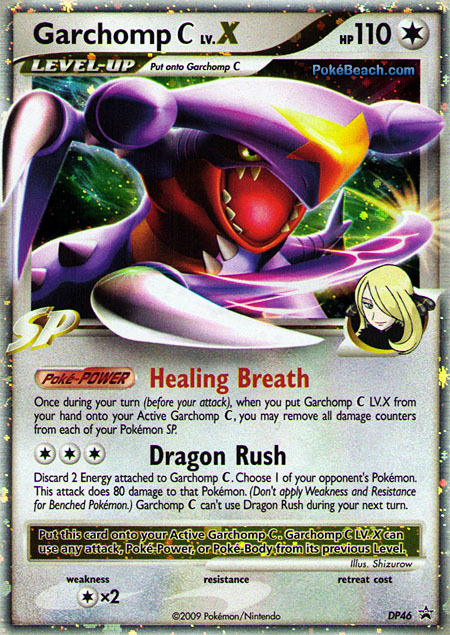 Thus, I decided to run my true successful Luxchomp once again for the next Battle Road I would go to, and that would be in Oswego, IL. Oh yeah, before I talk get to the main bulk of the report, I guess many of you want to know my Luxchomp deck. Well, I won’t show my deck list, but I will mention this. The Luxchomp I ran was a pretty basic one, with the usual trainer and energy line, as well as the usual attackers (Luxray GL and Garchomp C). It also ran the usual techs for a Luxchomp. Like I said, there is no Dialga G in the deck; however, I ran Mismagius instead, and I even ran Smeargle from Undaunted because of the Poké-Power, which I found could literally turn mirror games into your favor. Anyways, now with that done, it is time to move on to the event. Dad and I leave with all of our TCG supplies around the early morning on October 2nd, 2010. On our way, we hear that the tournament location changed from the Allied Bank to the Oswego City Hall, causing the tournament to start at 11:30 A.M. instead of around 11:00 A.M. We came to the City Hall quite early, so that gave us plenty of time to prepare. We turn in our deck lists, and then we study the metagame. After a little while, I have a practice game with Vincent B, and it is shortly after that the pairings go up, and so it is time to begin the tournament. Oh yeah, Seniors are combined with Juniors because there were only 5 Juniors, so in all, Seniors have 4 rounds, top 2 cut, while Masters had 5 rounds and a top 4 cut. He starts the game with a Togepi active with an Eevee and two Drifloons on his bench, while I have a pretty good start. Quite early into the match, he managed to pull out Umbreon UD, and I find Umbreon to be a bit of a problem due to its first attack. Luckily, I manage to fully set up my Garchomp C in order to successfully get rid of it while it is on the bench. Then, he proceeds to pull out two Drifblims, one from Undaunted and the other from Stormfront. I find a way to knock out both of the Drifblims, and then he manages to evolve the Togepi into a Togetic. I KO the Togetic, and I continue to take more prizes to win the game 6-0. Good game Matthew! He started with a Stunky active with a Murkrow on his bench. Like the last game, I have quite a nice start. He manages to pull out a Houndour, but I manage to KO it with Garchomp C. He manages to evolve his Stunky into Skuntank, and then he attacks me with it. I proceed with another KO to his Murkrow with Luxray GL, and then I take down the Skuntank afterwards. I proceed to KO a few more Pokémon to win the game. It was certainly a fast game, but I would say it was a fine match as well. Good game Dallas! Tommy is a pretty good TCG friend of mine, and is also a pretty good player. He took 1st place in the Des Plaines, IL, Battle Road a week earlier with an undefeated record, so I could tell this was going to be a tough match. This match was also longer compared to my other matches in swiss. Unfortunately, I have a rather bad opening hand. I could tell that this hand wouldn’t get me very far. As for him, he has a much better start compared to mine. I don’t really remember much about this game, but from what I know, he managed to take some good KOs off me. I do KO a few Pokémon on his bench, but he strikes back with his Ambipom G and Toxicroak G, and that pretty much allowed him to win the game. Oh well, good game Tommy! Once again, it is back to having a quick game. He starts with Scyther with a Treecko on the bench, while I have a Garhomp C start. I manage to draw a DCE, so I attach to Garchomp to deliver 30 to his Scyther. He uses Bebe’s to search for Scizor Prime, but since this was his first turn, he couldn’t evolve into Scizor, so he ended up making a bit of a misplay. After that, I proceed to KO the Scyther, aware about the possibility that he might still have the chance of pulling out Scizor Prime again. He pulls out his Treecko and evolves it into Grovyle, and then he attacks me with it. 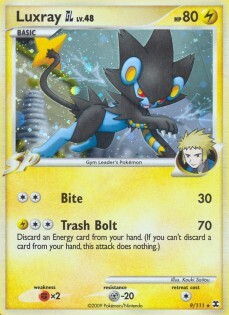 It was his only Pokémon left though, so I pull out Luxray GL, and I KO it using Luxray. Good game Quinn! Swiss is finally over, so now it is time to see who made top 2. Tommy has already made it since he came 4-0, so now it’s between either me or Konnor H. (who is running Kingdra) facing Tommy in top cut. It eventually turns out it’s me. After finding that out, Tommy and I turn in our decks for deck checks, but then Tommy has a sleeving issue, so I help him resleeve his deck. Afterwards, we shuffle up, and we begin the top matches. He had some bad luck this match sadly. He really couldn’t draw any helpful supporters on some of the earlier turns. As for me, I have a fine start. Since I seem to have an upper hand, I use Garchomp C to knock out most of his Garchomps and Luxrays in order to make sure I continue to be a ahead of him. I also pull out Smeargle and Uxie right away in order to make sure I can get good draw in the process. He does manage to counter back a few times though, and I do the same, but I mostly use Ambipom G to do so. I take several prizes, and it is eventually down to one prize left for me. With not many attacking options left, I deliver 60 to his Garchomp C. My intent next turn is to do 60 to KO it since there aren’t many options for him left to use something else. He uses Garchomp C to attack another Pokémon of mine, giving me a chance to win. I go and I do 60, but then he reminds me that I can’t use “Zen Blade” the turn after it was used. I am disappointed by this, but then I look at my hand, and I notice a Poké Turn. I think about how you are supposed to consecutively use “Dragon Rush,” so I decide to apply this knowlege with “Zen Blade”. I retreat my Uxie to pull out one of my Pokémon SP. Then, I Poké Turn the SP and pull out the Uxie again. Now I can do “Zen Blade” again, so I do just that to KO his Garchomp and win game 1. I once again have a good set up, but this time, it is his turn in the finals to have some good luck. 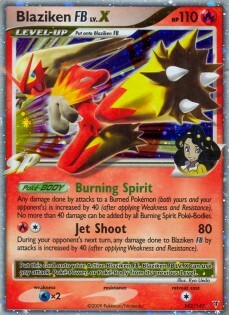 He manages to pull out his Blaziken FB. 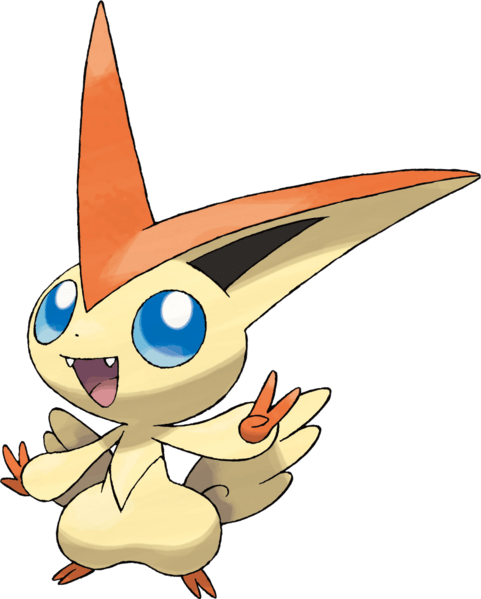 From there, he starts to use “Luring Flame” a lot, and Luxray GL gets commonly affected. Despite this, I use my Poké Turns to escape the burn, and a few times, I manage to pull off a few KOs. Then, he made quite a winning move. He “Luring Flames” my Bronzong G, and now my Bronzong is stuck. With its high retreat, the only way out is if I draw another Poké Turn, but with the Bronzong in a tough spot, it is going to be tough to actually get some drawing going, so my only hope now is if I can top-deck another Poké Turn. Sadly, this isn’t the case. Throughout most of this match, Bronzong is simply stuck, and he manages to pull off some good KOs on my bench. Bronzong eventually dies from the burn, but it is too late to make a comeback now; thus, Tommy wins game 2. It is back to bad luck for Tommy again. I start the game, but there isn’t much I can do, so I pass. 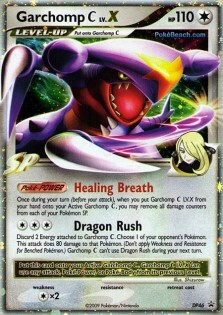 He goes and doesn’t do much either, but he does attach a Call Energy, and then he grabs two Garchomps. Like my previous matches, I go with my usual technique of pulling our the Luxrays and Garchomps early to stop him from pulling out his Luxrays and Garchomps. The game is pretty fierce. We kind of KO each other a bit back and fourth, but then time is called. It is my time, and I’m turn 0. I have about 2 prizes left, while he has about 3 prizes remaining. Tommy and I didn’t do much on turns 0 and 1, but after that, I did manage to KO a Pokémon of his to take a prize. He then goes for turn 3 and pulls out Toxicroak G to KO me back, but at this point, I had 1 prize left, while he had only 2. Because of that, I managed to win game 3. Great games Tommy! And so I win the Oswego, IL, Battle Road! I get 4 packs, two HeartGold/SoulSilver folders, a HeartGold/SoulSilver bookmark, and a Victory Medal. At this point, I am quite drained after such an intense finals game, so Dad and I go home shortly after. Definitely a great day. PokeBeachDad and I decide to go to this Battle Road the following day. I found my Luxchomp build to be successful, so I didn’t change my deck. When we came to the cafe where the Battle Road took place, I, like usual, study the metagame for a bit, and then the pairings go up, and we go and sit at our respective tables. Oh yeah, there are only 7 Seniors, so there are 3 rounds and a top 0, while the Masters have about 13 Masters and a top 2. He starts the game with a Toxicroak G (not the promo one), while I start the game with a Misdreavus. I start the game, so I use “Show Off” to grab a basic energy. He goes and manages to play a Garchomp C and a Skuntank G down. I go and I evolve into Mismagius and attach an Expert Belt to it so I can KO the Toxicroak quickly, so I do just that. After that, I then proceed with Garchomp C to KO his Garchomp. 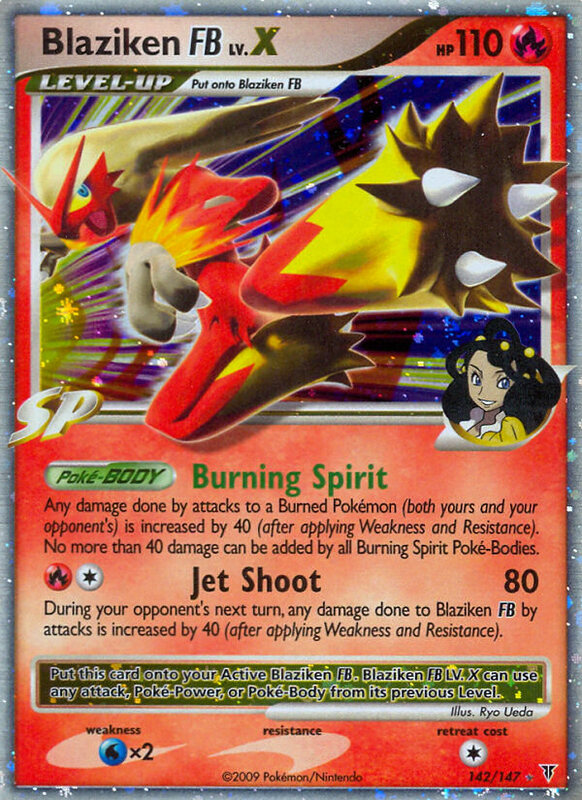 He counters back with Skuntank’s “Smoke Screen,” but luckily, I find a way around it. He pulls out another Garchomp, but it also goes down pretty cool. A bit later, I win the game 5-0. Good game Ben! He got a good start, so he managed to pull out a Machop onto his bench (he started with Trapinch by the way). I go and set up Garchomp, and I eventually take out a Pokémon of his. He then pulls out Machamp, and KOs the Garchomp back. Now it’s my turn, and now I have to find a way to take out his Machamp. I pull out Uxie, and now I want to find a way to get Uxie Lv.X out fast to KO it. I had a Pokémon Collector in my hand, so I use it to grab a Lucario GL, a Crobat G, and an Azelf. I use Azelf to get a needed Pokémon out of my prizes. Afterwards, I find that I can’t KO the Machamp, so I let him kill my Azelf. It is then I manage to get out the Uxie Lv.X. With that, I manage to KO his Machamp using it. He then counters me back with his Uxie Lv.X, but really from that point on, he never really pulled out Machamp. I Power Spray him several times to get the advantage, and I also KO any Machops or Machokes I find. I also use Garchomp C to KO his Flygons too. Eventually, I win the match. Good game Jason! PokeBeachJeremy P. is the older brother of my last round opponent. Many of you might remember him as being the only senior in top 64 at Nationals to use GeChamp, and he still happens to use it, so I viewed this game as the finals already. It was also one of the most epic games in my life. He had a Spiritomb start, so that hindered me. He managed to pull out a Gastly and a Machop. From there, he also began to evolve the Pokémon via his Spiritomb, so it started to become a problem. Despite this, I eventually manage to break out of the Spiritomb lock, and then he pulls out a Machamp. Luckily, I have the Uxie Lv.X out, So I use it to KO the Machamp. 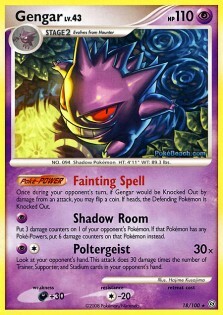 That’s when he starts to focus a bit more on Gengar, so he pulls off a “Shadow Room” on my Uxie. 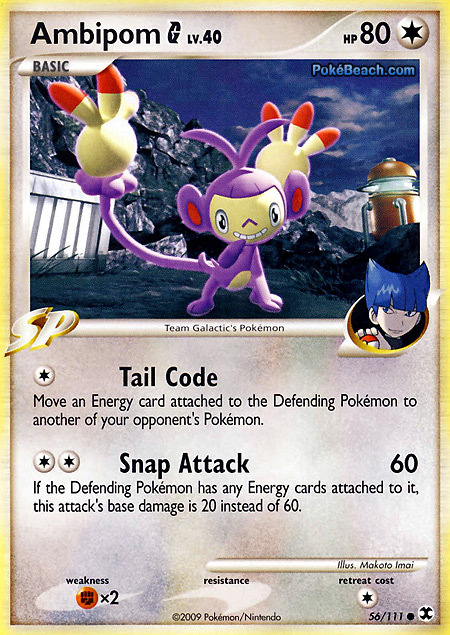 I find this to be a bit tough, so I pull out Amibpom G and use “Tail Code” to move the energy away from his Gengar, and pretty soon, he doesn’t get much luck drawing energies throughout most of the match, so now I can gain quite an advantage; yet, he doesn’t give up. He plays a Judge to stop me from leading, as well as to get an energy. Sadly though, he still doesn’t get an energy. As for me, I managed to draw a Professor Oak’s New Theory. Comboed with Uxie Lv.X, I managed to recover my hand very nicely. It is also around this time he pulls out Machamp, but he still can’t draw much energies. That’s when I realize I need to find a way to KO it fast, and I need two Poké Turns to do it. I have to pass a turn after realizing that I can’t get another Poké Turn, so he goes and still doesn’t do a whole lot. 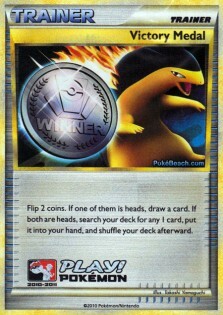 Then, next turn, I manage to draw the 2nd Poké Turn. I Poké Turn my active Ambipom G, and then I pull out Luxray GL Lv.X to “Bright Look” his Machamp. I play another PokéTurn to “Flash Bite” the Machamp; after that, I retreat Luxray, and I pull out Uxie Lv.X to KO the Machamp. Now that was a professional move there. He pulls out Gengar, which has some damage counters left. He finally KOs the Uxie after he managed to draw an energy. I go, and I pull off another Flash Bite on the Gengar, and then after that, I pull out my benched Azelf and use “Lock Up” for the KO. He flips for “Fainting Spell” and gets heads, and then it is around this point we are about one prize card away from winning. He pulls out another Gengar to level up to Gengar Lv.X. 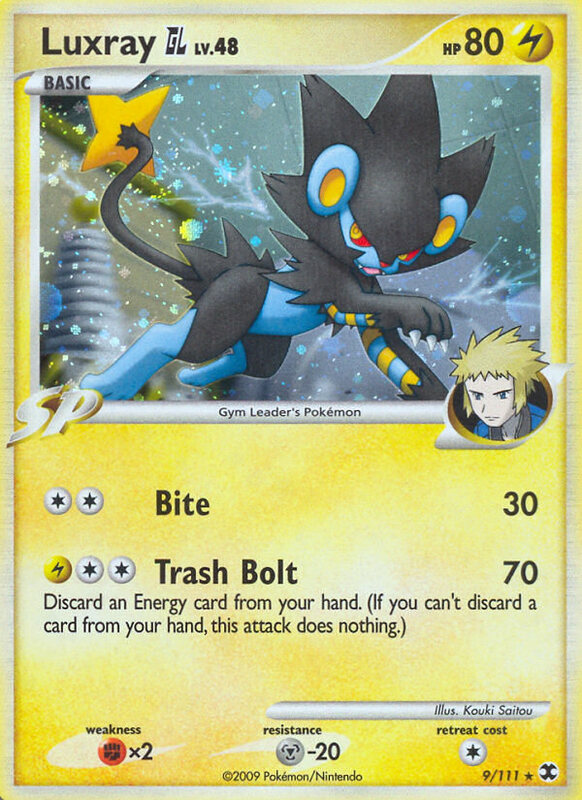 I pull out my benched Luxray GL Lv.X. With time called at this point, I find myself in a tough situation; however, I notice an Expert Belt in my hand. I think, “Well, he has only one prize card left, so the two prize card rule won’t matter now.” I attach the Expert Belt to Luxray, and I deliver about 90 to the Gengar. He goes and uses Poltergeist, but it only ends up doing 60. I go, and I manage to pull off the winning move. I use Bite to KO the Gengar, and he flips for “Fainting Spell” and gets tails, winning me the game. Awesome game Jeremy! Anyways, I win the Lockport, IL Battle Road! I get 4 packs and a Victory Medal once again. After that, Dad and I leave the tournament. Yep, at this point, I have literally won a weekend of Battle Roads! That weekend of Battle Roads was definitely awesome, now it is time to move on to the final week of Battle Roads, and if I manage to do well in another tournament, I might make another report, so stay tuned! Furthermore, I would like to say that this is a very good article indeed. Yes, in addition, a very well-written article. Therefore, I’d like to say that the article had much quality. In summary, the article was very good indeed, and in conclusion it was very well-written also, as well, too. literally that was definitely a great summary indeed! Furthermore I would just like to say that that was a good summary. Nice job JPN-Gallade! Is this your last year in Seniors btw? Thanks for the comment Adam! Oh yes, you are correct. This is my last year as a senior. Thanks man! I hope you too will have an awesome season this year! Go ahead and delete these extras. I have no idea why firefox barfed. S-S-S-Sion-san? What are you doing here? And so, the truth is revealed! JPN-Gallade has been using etherlite to win! He’s able to see your hand when you play him, and he can make you misplay. Sneaky, sneaky. I’d switch over to Chrome or Safari, Firefox has lost its touch the past year or so. Even though I blamed Firefox, i just did some fact-checking. Seems that one of my extentions, noscript, decided that while the main 6p site was a-ok to run scripts, your comment backend’s site was “not cool dude” and was blocked. I’ve since fixed it, i think.